Whether you’ve just received your braces or you’ve had them for months, daily oral care isn’t quite as easy as it used to be. However, that doesn’t mean you can’t make minor adjustments to keep your mouth healthy once you finish treatment! 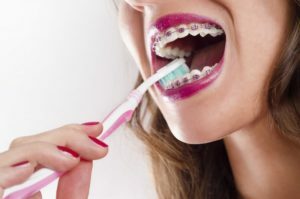 If you struggle to brush while wearing braces, your orthodontist in Columbus offers seven tips that you need to know about. With these tips in mind, you’ll have a beautiful smile that’s straighter and healthier than ever before! To prevent gingivitis from appearing, it’s key that you brush twice a day. The sooner you hone your brushing technique, the easier it will be to commit to a routine that works for you. To start, rinse your mouth to remove any loose food particles from your teeth and braces. Then, rinse your toothbrush and scrub any food you see, followed by rinsing again and applying toothpaste. Next, hold your brush at a 45-degree angle and brush back and forth using short, controlled strokes for at least two minutes. Finally, brush your tongue and rinse your mouth. If you start flossing now, you’ll be shocked by how much easier it will be once the braces come off. While you should be flossing in between your teeth at first, be sure to do so underneath the archwire too. This can easily be done using a floss threader, which is essentially a large plastic needle specifically for orthodontic hardware. Whitening treatments are not designed to work with orthodontics. If you use whitening products already, discontinue their use until the braces come off. The last thing you want is an unevenly colored smile. Interdental toothbrushes can help you clean underneath wires and brackets. Make sure it’s a soft-bristled brush to avoid damaging your teeth, gums, or hardware while brushing. Fluoride gels or varnishes provided by your orthodontist in Columbus can reduce the risk of decay and gum disease while wearing braces. You can also purchase fluoride gel to incorporate into your daily oral care routine. It will also work to replace minerals lost in tooth enamel due to harmful acids. Did you know that brushing too hard, too long, or too many times a day can actually damage your enamel and gums? To prevent enamel erosion and receding gums while wearing braces, stick to brushing twice a day for a maximum of two minutes. Avoid snapping floss as well, as this can damage enamel. Need more tips from your Polaris orthodontist? Schedule an appointment with him today to keep your oral health in check during treatment! Dr. Amin Mason earned his dental degree from the Ohio State College of Dentistry. He also holds a certificate in orthodontics and a Master of Science in Dentistry, which he received from the University of Colorado. To learn more about his practice or tips for oral care with braces, contact him through his website.